Here in the UK we are just under two weeks away from pancake day, but in some European countries like France, Belgium and Switzerland they will already celebrating their Jour de crêpes this coming Saturday as this day, 2nd February, is La fête de la Chandeleur. 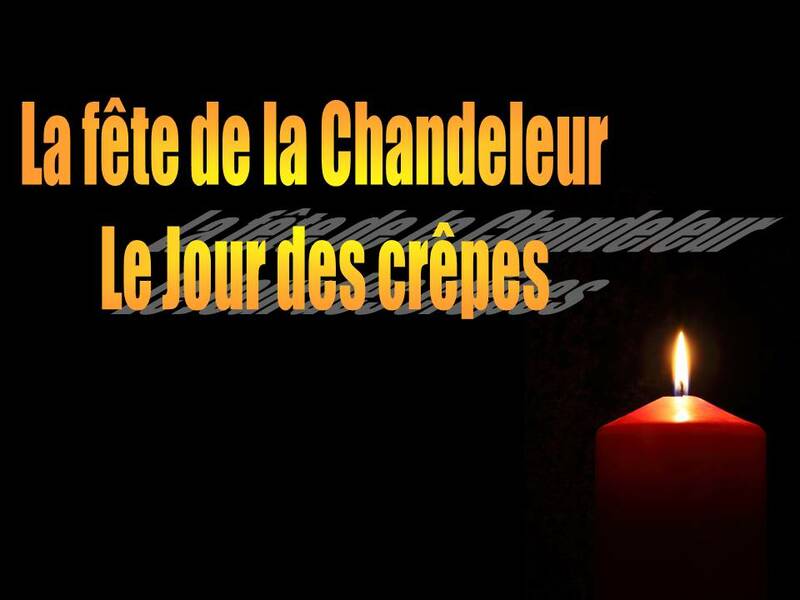 Depending on what you read and where, this has its origins both in a pagan festival of light (the roundness of the pancakes bearing some semblance to the sun) and in the Christian festival of Candlemas, or Christ’s presentation in the Temple, the word chandeleur being derived from the word for candle chandelle. Either way it’s another occasion, like Mother’s day, when different cultures mark events in different ways. This means it’s also an opportunity to develop pupils’ sense of intercultural understanding by drawing out the similarities and differences between what we do and when, compared to other cultures. A simple activity is to sort some statements into those which relate to Pancake day in the UK, those in France and those which relate to both using a Venn diagram as in this .ppt slide: Le jour des crêpes. There’s plenty more information as to the origins of La Chandeleur on Wikipedia as well as on sites like Mômes. This site also includes some rhymes to do with La Chandeleur and some recipes for crêpes. For more advanced learners of French there is this video explaining the history of La Chandeleur and another on L’histoire des crêpes. 2012 – Olympic year! Whilst preparations are being finalised for the London games in July many of us teachers will be thinking about how we can exploit this in our classrooms over the coming weeks and months. What may not yet be on everyone’s radar is that the Winter Youth Olympic Games are taking place from 13th – 22nd January in Innsbruck. This is in fact the inaugural Winter Youth Olympics and is for young people between the ages of 14 and 18. The first Summer Games were held in Singapore in 2010. This will mark the third occasion that Innsbruck has been an Olympic host city (the Winter Olympics in 1964 and 1976). The Innsbruck 2012 official site is in three languages (German, English and French) and so provides plenty of authentic material and language about winter sports and the Olympics in general, including a section on the Olympic values (excellence, respect and friendship) and the mascot, Yoggl. For those teaching German it is an opportunity to focus on Austria and the geography of the country, perhaps following the torch relay (Fackellauf/relais de la flamme), now into its 11th day. There are links to information in German about each place on the relay route which could be exploited for skim reading e.g What could a visitor see/do in Eisenstadt? The Torch relay page has links to “A day in the life of a relay runner” in French and German, so this could form the basis of a reading exercise where learners put sentences in the correct sequence. There is an animated film (Yoggl goes CEP) featuring the mascot Yoggl; this has images associated with many of the Olympic themes and values which could be exploited for oral and written work. Fussballfieber or more football fever! 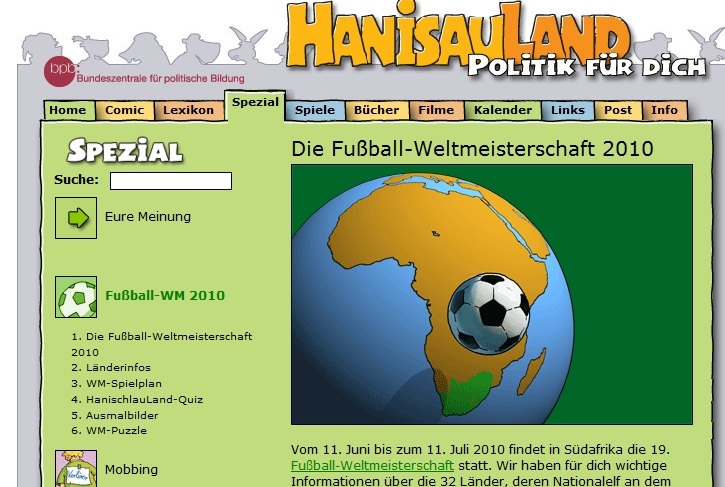 If you are after some authentic texts in German for the World cup look no further than some of the many German sites geared towards children. One of these is Hanisauland produced by the Bundeszentrale für politische Bildung. The screenshot shows their home page for everything to do with the World cup. On these pages you can find information about all the countries playing, including geography and climate, together with images and a clip of the relevant national anthem. Another useful site is ZDFtivi which not only has a blog about the world cup but also more general information about the countries of Africa. There is also a video about a young girl living in Senegal and one about a boy from Mali who aspires to be a professional footballer. There are also some interesting materials and video footage about the “Big five” in South Africa which could be useful for some CLIL. 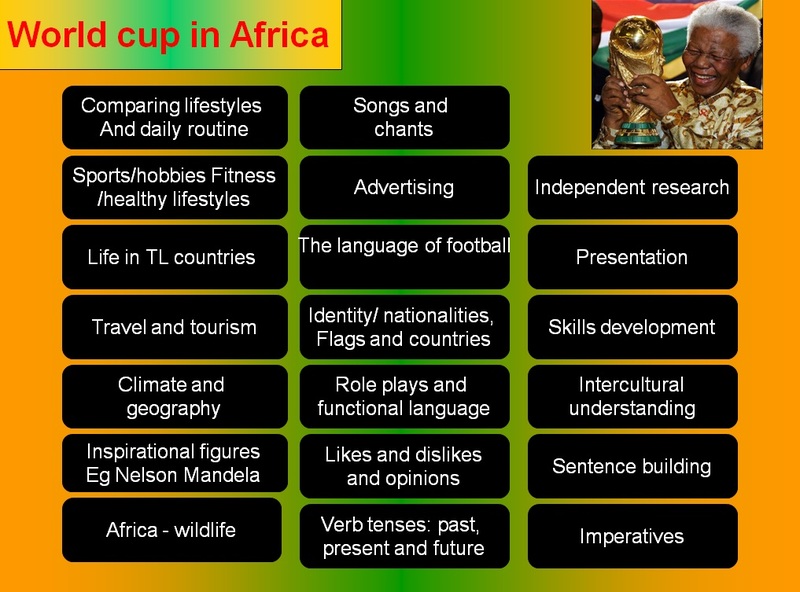 The 2010 World cup in South Africa is a fantastic opportunity to either complement the text book, or to get away from it altogether, by making links with other subjects in the curriculum. This can be done either through the whole curriculum dimensions or by borrowing content from other subjects and looking at those key concepts. A focus on one of these countries eg. francophone Africa, South America or the German speaking world. There is information about South Africa and the host cities (including images) on the FIFA website in French, German and Spanish. Exploring the climate of the host country or that of countries participating. The website Monjtquotidien has recently added a video about the French national team training at altitude. A few days previously there was a video about who had been selected for the French national squad and there has already been a video about the sale of tickets and the ball to be used in the competition. Using the texts of songs and football chants to develop listening and reading skills – some examples can be found in German and French on the songs page. Sponsorship and the role of multinational corporations (Business and enterprise/Global issues). You can see the list of official sponsors here. This is just for starters………. 5 rules for good/bad design of flags (French). This PDF includes good and bad examples of each rule. SCIAF youth – video resources and blog about life in the Democratic republic of Congo. The same site has just produced some resources in Spanish about Archbishop Oscar Romero. You can find information about Didier Drogba on wikipedia or on his own website. This is the link to the video of the song Ja der Fußball ist rund wie die Welt and here is the text. World cup 2010 footballs – Fair trade? The 2010 World cup is a great opportunity to look at some wider issues such as Fair trade, working conditions, and child labour. You can find more information in French about the production of Fair trade footballs here and here. In German the site Fuβball ohne Grenzen has some useful resources and information as does this site about the manufacturers of sports goods. Voll korrekt from oekofair on Vimeo. and you can read more about the production of footballs for the World cup here. Fair trade resources – orange juice, jeans and trainers! The same site has other useful resources which could be used as part of a cross curricular project using the global dimension to link languages with subjects such as geography and citizenship. This dossier Le parcours d’un jean addresses issues such as the production of cotton and raises awareness of working conditions in those parts of the world where fashion goods are produced. The Jeu de la basket involves working out some numbers from some clues in French and then discussing how these figures relate to the production, promotion and sale of trainers. The clues might need to be altered slightly, depending on the ability of the class but the activity is one that could be adapted to other contexts. You are currently browsing the archives for the Global dimension category.